I’ve now, at time of writing, played around three hours of Switchcars, the wonderful, car-swapping ‘runner’ from altfuture. It’s been hard, but I’ve managed to force myself away from it for long enough to write up a little something about the game following it’s entry into Early Access on Steam on the 4th of March. The premise of Switchcars is exceptionally simple, as with all good titles, you are trying to reach a set point in the game, you do this by avoiding obstacles, things change as you get further along, and there’s a cool mechanic pushing it all along. In this instance however, the set point is 105 years after the earliest start point of the game; the objects to avoid are normal obstacles, and giant space-time worms; the elements that change are the entire setting, and the vehicles of that era; and the cool mechanic is an ability to take control of any of the different vehicle varieties in the game, currently just over 1000. Phew. Three hours in, I have experienced less than half of the vehicles. You play the game as a little, generic figure – we’ll call them Sam Switch. A little, generic figure who can use a grapple hook to zip towards things, and can instantly commandeer vehicles, like a little 2D Rico Rodriguez. Sam can also pocket up to three vehicles, packing bicycles thru battle-cruisers into their pockets. It’s all done through simple key presses, basic enough that you can run on automatic after a few turns – you zip towards a vehicle, requisition it, race towards another, tucking away the first and then taking the second for yourself with the key press you want to assign the vehicle to. Each of the 1000+ vehicles is different, be that through the years it is available in, it’s top speed, or even the sound of it’s horn. 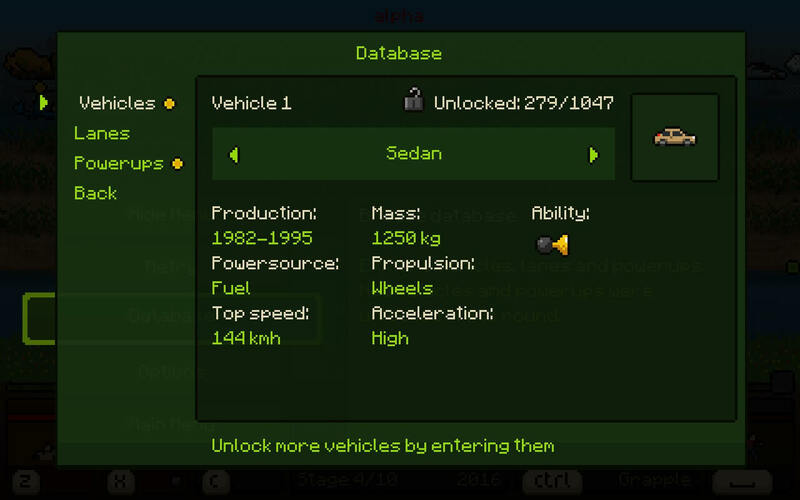 The variety is completely overwhelming, and while some of the vehicles might seem similar to one another, a long play through will expose you to a massive slice of the game’s selection – and if you do hop into them then they are added to the database, for your analytical pleasure. I say that the controls will come naturally, they certainly do after a while, however the game’s default controller set up is set for the analogue stick, a strange default as the game is really only eight directional, and the d-pad is much more natural for this type of movement – especially considering the car’s acceleration is done by pushing in the direction you want to go, not a ‘button’ input. That said, the process to change it over was simple enough – and then I was away and playing the game much more comfortably. As you finish each level you are shown which vehicles you used, and which you had used for the first time. 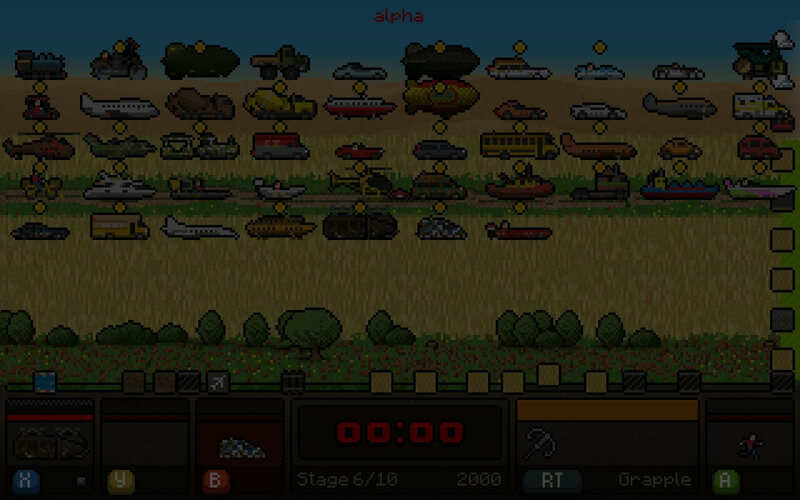 As well as a mass of vehicles, evenly spread over the 105 years – which each play out at 3 levels if you play through the standard mode – there’s also just over 40 add-ons available, these are simply collected by passing a green barrel, and can be added to whatever vehicle you wish at the press of a button. The upgrades range from changing the fuel type of the car, to changing the movement type, to adding a weapon to the vehicle. Some of the wonderful perversions I’ve already have included an armour clad moped, which literally looks like a big block of metal, and a winged bicycle – which rockets forward and lifts off if you give it the chance. While I stated earlier that some of the vehicles might feel similar to one another, each one does look different, and each of those appearances have had a massive amount of depth added to them. Each vehicle’s condition with deteriorate with damage: paint stripping away from impact, naked tires screeching and sparking on the road, the body dirtying as you ride off road when it isn’t prepared for that. It’s a depth of detail completely unexpected in a game in which you could well ditch your car in a matter of seconds, and it’s absolutely wonderful to see. So, we’ve established that the game features a lot of vehicles, and has a lot of power ups. But, the game also features over 100 ‘lanes’ – the levels through which you progress through within each level. After a set duration within a lane you’ll be flashed to another, in most cases there’s a warning icons advising you of the terrain type that each row of the level will convert to – although sometimes that’s not particularly useful information because you’ll have been zipping along a glorious racetrack only to be plopped into a swamp area, and you haven’t collected any boats. Yes, this WAS terrifying, thanks for asking. The lane variety is as diverse as the vehicles. I’ve been trundling along, dodging windmills and farms in a car only to be flung into space, hurtling between asteroids, and desperately trying to get into one of the super-cool rockets, or spaceships. Similar to the vehicles they are carefully set out to cover the different years that serve as the game’s levels – a method which allows the tighter time frames of the later years to be achievable through some outstanding vehicles, while still keeping content fresh. Time limits are a thing too, although the game does include a free-play mode if you’re not one to work under pressure. Each year is split into levels, and between each of those there’s a safe zone, a point in time where Sam isn’t being hunted down by deadly, hungry, belly-flopping time worms. The areas in between though feature a timer, and the second that hits zero the game releases the perfect switchcar rival into the field. 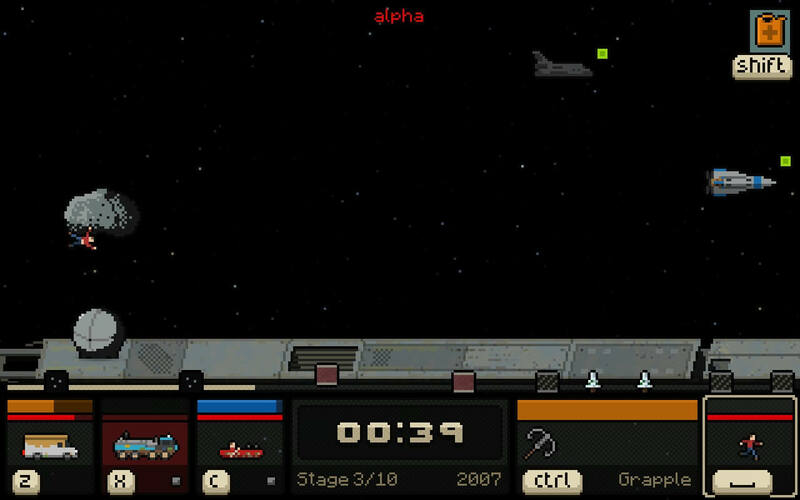 All of a sudden careful dodging of the various lane obstacles is replaced with trying to get away from the space slugs, be that through dodging them, or by trying to rocket massively ahead. The evil space worms no doubt want the cool time-jumping, and vehicle shrinking gear back – they are relentless. It completely changes the nature of the game – and also ensures that we don’t spend too much time gaming certain lanes in each year. Gaming the lanes is still possible to a degree however, in the current build the game only generates certain off screen elements, and if you then return to an area you have passed, or double back to re-reveal a new screen, you will be presented with different vehicles and layouts. It’s not a major flaw, as most of the time you’ll be racing forwards, in fact it’s quite useful if you’ve ran out of fuel, or just smashed up your last car and are looking for a replacement. Moving vehicles are a hazard kids. There’s other dangers within the lanes, arguably more deadly than the worms at times. For a start, the obstacles I have alluded to are just over 150 items, ranging from rocks, wheelbarrows, castles, windmills, which litter the lanes and must be dodged or you’ll take damage to your vehicle – there’s also the other vehicles on the lane, with which a head on collision can normally end both of those involved. This is particually worthy of note, as currently if you grapple hook towards an object, or vehicle, and do not get out of the way in time then you’ll smash into it and bring your run to an end – I have done this far too many times to count. The thing that’s probably the most refreshing, and enjoyable, about the game is that the game is very unforgiving – and that’s just fine. Lots of games flaunt that they use procedural generation for level design, a lot of games call themselves rogue like – but in those games there’s a massive amount of restraints in place to create a curve, the best example of this is the level depth in dungeon crawlers which restricts the difficulties of foes. Switchcars phases the content over the different years, sure, but you can access those points at any ‘difficulty’ and as your vehicles are you weapons and spells, you are immediately ‘equipped’ and ready for the challenge – and it boils down to reactions, awareness, and a little luck. Expanding on the above a littlel, when you start the game you can choose which of the years you wish to start yourself in. Initially you can only chose up to 1988 until you unlock later levels by simply progressing far enough through the game, although completing three phases within a year will move you forward a year, and as you proceed through those years in the normal arcade mode you unlock them as starting points. If you’re a collector, and are desperate to 100% collect all of the vehicles this is extremely useful, as you can then drop into the game at the point you require in Free Roam, and have a ride around until you find the ones you are missing. It’s probably the most refreshing game I’ve played so far this year, and I’m going to go play some more of it now. The developer is going to be adding more content throughout early access, as well as crunching any bugs they might find – however, in my eyes this is a title which is already fully playable and enjoyable, and I thoroughly recommend you give it a look.